Most chefs agree that the best dishes have mixed flavor and texture profiles that both compliment and offset each other. The basic idea is to have no single flavor dominate because it becomes overwhelming. Here's a simple snack plate that you might try: a piece of salted chocolate paired with blue cheese and a juicy sweet fruit. 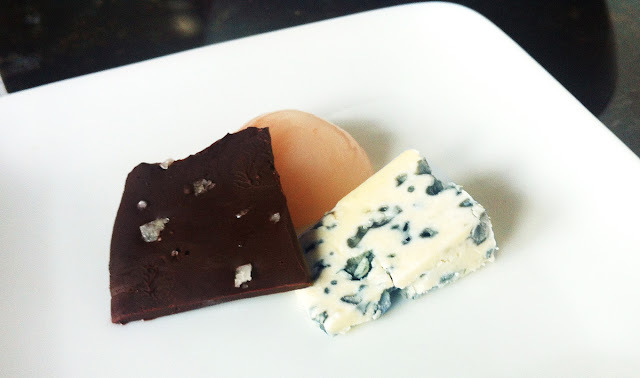 In this case, a 1/2 oz chunk of homemade dark chocolate with sel gris (grey sea salt) is plated with a piquant blue (Bleu d'Avergne) and a juicy, ripe lychee. Mix to your taste - if blue is too strong, go with more mild, like a cheddar or gouda. If lychee is too sweet, figs or pear are also good.